A wonderful day has come at last! The new St. Joseph the Worker Catholic Church construction is complete and the dedication and consecration will be held Saturday, February 17, 2018. Parishioners, community and clergy leaders and guests will join St. Joseph’s Pastor, Father John Gillespie and the Bishop of the Raleigh Diocese, Bishop Luis Raphael Zarama at the noon service. For all interested in seeing the new church, a Community Open House will be held on the following Saturday, February 24, 2018 from 12:00 to 4:00 p.m. The public is invited to visit and see this wonderful addition to our community, meet parishioners and enjoy light refreshments. As a welcoming faith community we are on a journey to provide an expanded place for worship and prayer so we may nurture the growth of our community in both size and service. For the Power Point presentation of our journey CLICK HERE. Increase seating capacity from 95 to 150. Create a comfortable, accessible and welcoming place for parishioners and visitors. Meet American's with Disabilities Act (ADA), building/safety codes and diocesan requirements. If you have any suggestions, ideas, want to participate in meetings, fund raising or need a stock transfer form, please email Linda Dean at stjoseph@embarqmail.com. Mass Schedule: Sunday 8:00 a.m. 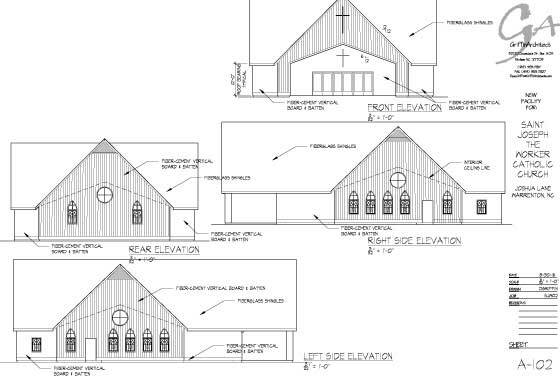 Besides donations and pledges, you can now support the building of the church in a way that is special to you or to honor a loved one. The bottom line? The more we raise the sooner we burn the mortgage! By Pledge: Consider a sacrificial pledge. Pick up your pledge card at Mass. Donations to St. Joseph The Worker Catholic Church are tax-deductible to the fullest as we are a 501(c)(3) organization. Consider the Saint Joseph’s Building Fund in memorial gifts, bequests, financial distributions such as IRAs, stock transfer and at tax time. Provide an in-kind donation of building materials, supplies and professional services. Join the Building Committee, share fund raising ideas, hold a fund raiser or just spread the word. Consider making monthly donations via the automatic on-line bill pay service offered by your bank or financial institution. to build a house for celebration and worship. to be Christ for others. 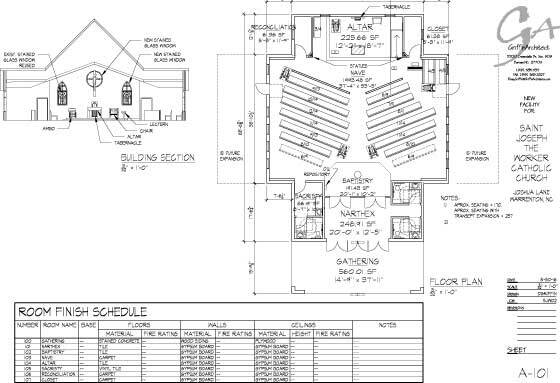 We are very pleased to report that great progress is being made on planning for construction of our new church. The following provides you with some key updates.